Miscake Stores is one of the Miscake lab research projects. It is a service for building online stores with ease. First of all, it is designed for people who do not want to spend their time on IT issues and want to be entirely focused on their business matters. 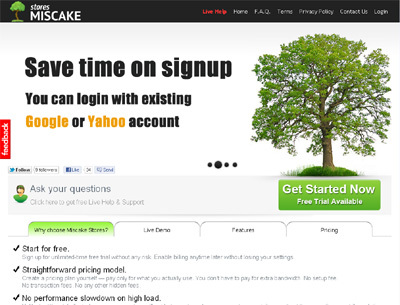 Moreover, users of Miscake Stores do not have to be familiar with programming languages, hosting and mailing servers administrating and other problems. We are open to dialogue, because while we are producing an excellent product on our own, we would like to develop it alongside with YOU, our customers, to make it even better. In order to achieve higher performance we use cutting-edge technology – cloud computing, which is becoming now a trend solution for different businesses. Usually you buy a server (virtual or not) or part of the server resources, but we propose you to buy a service in distributed environment, which means that resources for your business are allocated on demand, i.e. we are a SaaS (software as a service) provider.